organization can forego the time-killing, bureaucratic check-and-balance processes so often deployed in lieu of actual trust. productivity. His works have been widely translated. His best known book is Seven Habits of Highly Effective People, first published in 1989, which has sold several million copies. 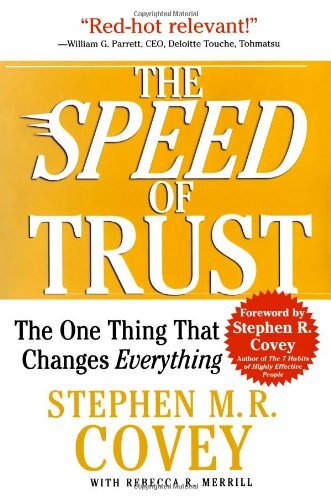 Other Covey books include: Principle Centered Leadership (1991), First Things First: to Live, to Love, to Learn, and to Leave a Legacy (1994), Daily Reflections for Highly Effective People, First Things First Every Day Because Where You're Headed Is More Important Than How Fast You're Going (1997), The Seven Habits of Highly Effective Families, and Seven Habits of Highly Effective Organizations. Covey received the Thomas More College Medallion and the Utah Symphony Fiftieth Anniversary Award in 1990, and the McFeely Award of the International Management Council for contributions and service in 1991. Results What's Your Track Record?